My extendable kitchen spout sticks. At several sites there is advice that relates to a weight under the sink. I don't think that is my problem. The sticking occurs whether I pull on the tubing from below the sink or try to put it back from above the sink. I thought about using WD40 but I am reluctant to apply it where I may get traces in the food. How should I fix it? I haven't see a sprayer hose that needed lubrication and I would be careful about using one, especially a petroleum based lubricant on a plastic hose. Check with the manufacturer for recommendations. The positioning of the weight is important and some manufacturers even mark the correct location. It should be on the "up" side of the curve but not so high as to interfere will pulling the hose completely out. You also want to check for any potential obstructions, including existing plumbing and items stored under the sink. It's helpful to have someone pull the hose out as you watch from below. I'm not talking about the kind of small sprayer that I often see off to the side of the sink separate from the main source of water. This is the main water source that is attached to a metal sheathed tubing and can be picked up, pulled out, and moved around the sink. I don't recall ever seeing a weight on the tubing. In the absence of a weight on the tubing, there has been gradually increasing resistance to pulling the spigot out. If there were a problem with a weight that had come off, I would think that it would have become easier to pull the spigot or tube out. The opposite has occurred, it is more difficult to pull the tubing out. It also does not go back easily. But it is the difficulty pulling the tubing out, above the sink, that is the most pronounced change. Do you recall whether or not there was a rubber grommet or seal at the base of the sprayer? I ask because it almost sounds like something may have become wedged in the sprayer spout sleeve. 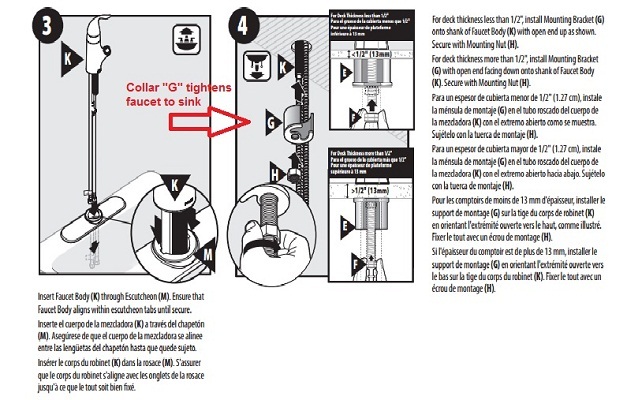 Do you have any pictures or a model number of the faucet? Adam makes a good point about checking for obstructions under the sink. Even something like the water supply lines can get in the way and cause problems. Beneath the sink is a bracket that tightens your "Pull Out" faucet against the sink. Most often you have to disconnect the water line before tightening the nut against the bottom of the bracket. 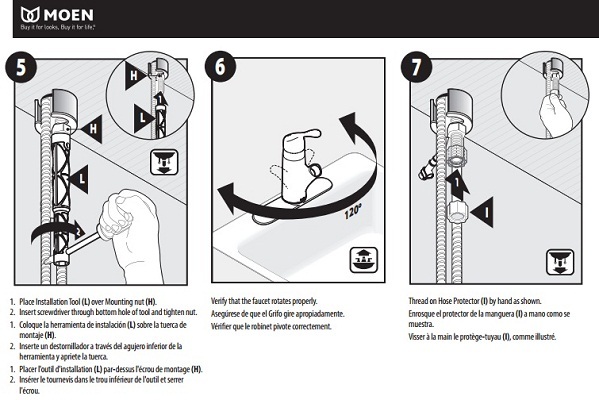 10) Restore water supply to your sink and test. These steps will absolutely repair your problem Abe1! And you did well to NOT apply WD40. Most pull out faucets experience this problem, but now you and The Community know how to manage the repair. Here are images of the process that will help you "see" the repair. The manufacturer can overnight the long socket, but be prepared to identify your faucet so you get the right socket the first time.